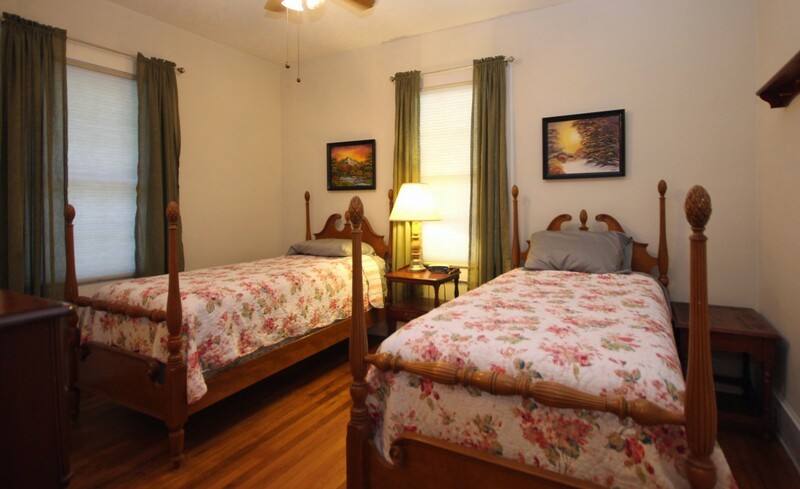 Our Brevard Getaway is Pet Friendly and Relaxing! 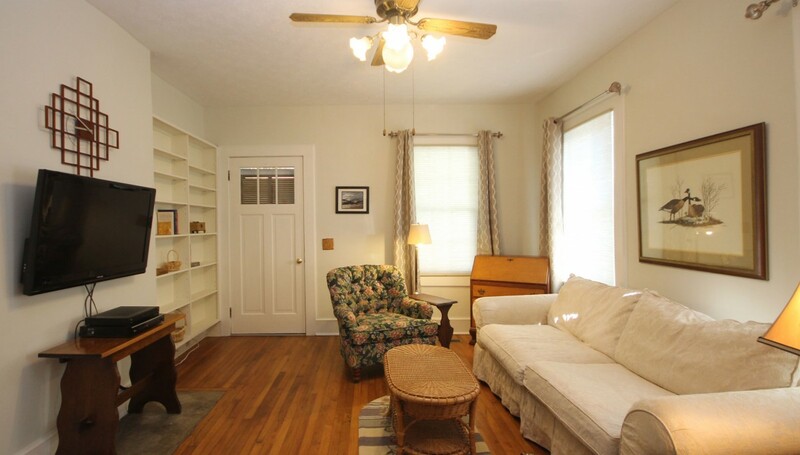 Comfy beautiful home in the heart of Brevard. The living room is just inside the front door, which you can see on the left edge. Plenty of space for dining. This is the view from the living room looking toward the kitchen. 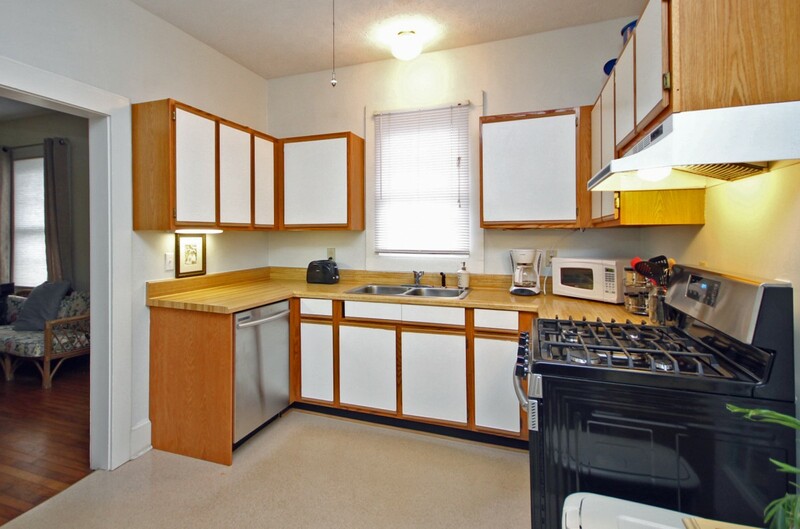 The kitchen has everything you need to cook while you are here. 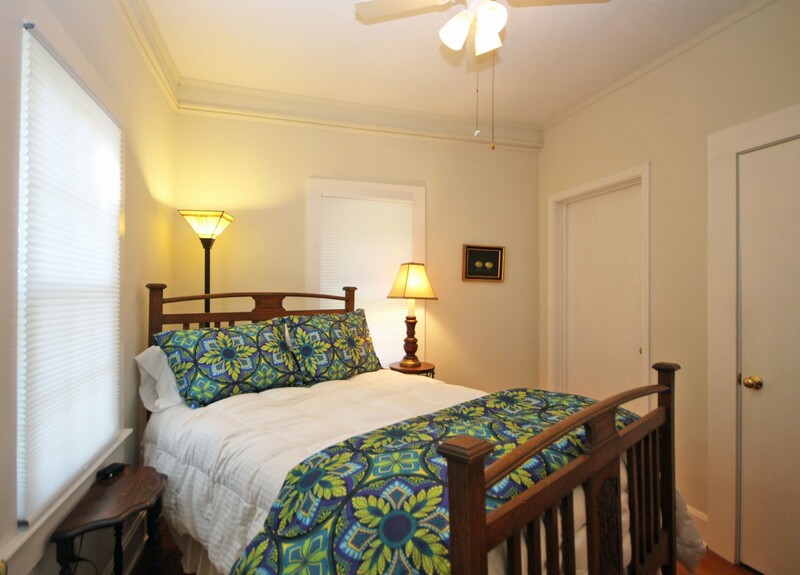 The main bedroom features a comfy Queen bed. This room has a lovely full size bed. These beautiful twin beds have been in the family a long time. We love them and we hope you do, too! 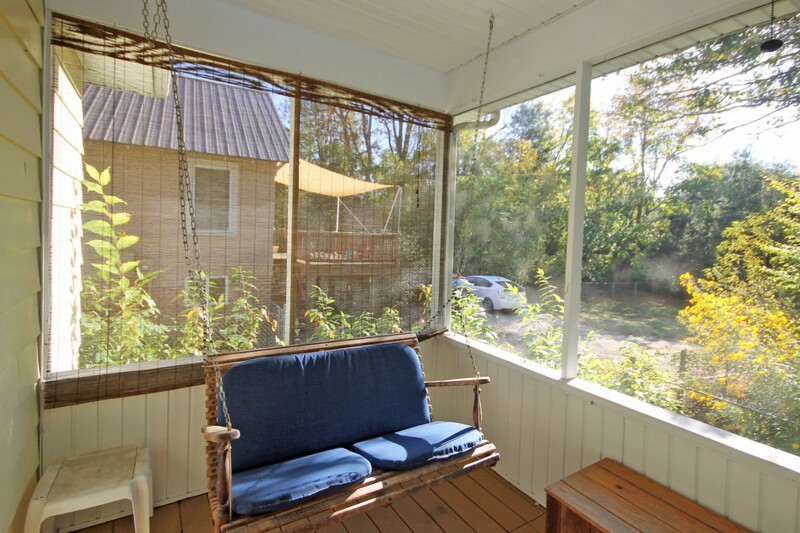 We love the screened porch that overlooks the back yard. 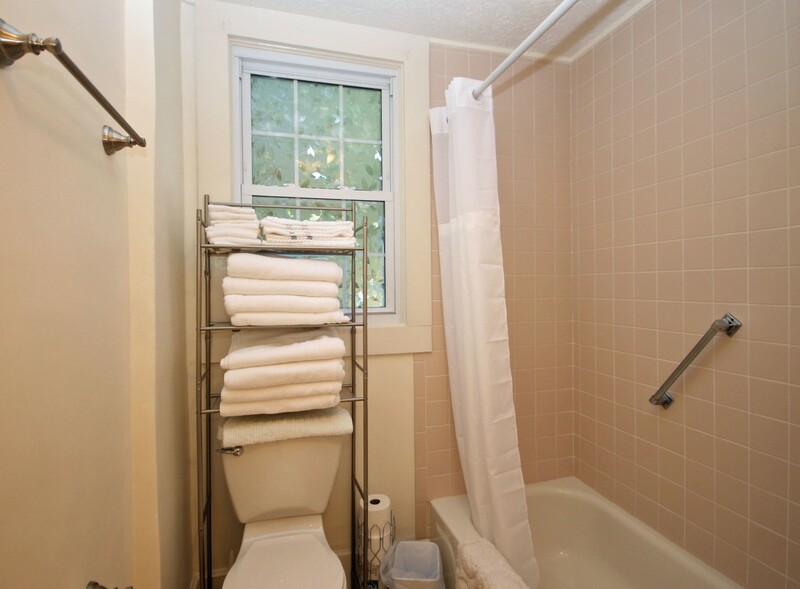 Here you can see the main bathroom which features a tiled shower. 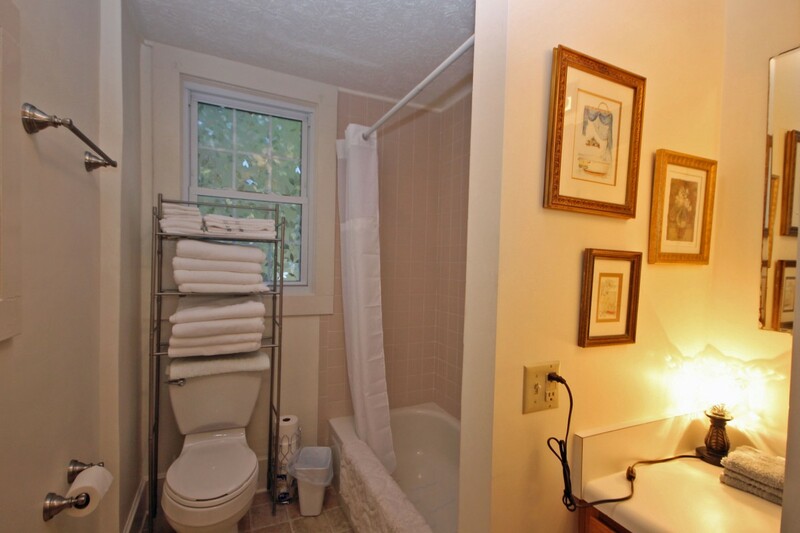 The half bath is beside the kitchen near the screened porch. The prior owner was a master gardener, and it shows! Here you can see the full layout of the living room, with the TV on the left. This view shows the living room, looking toward the front door. 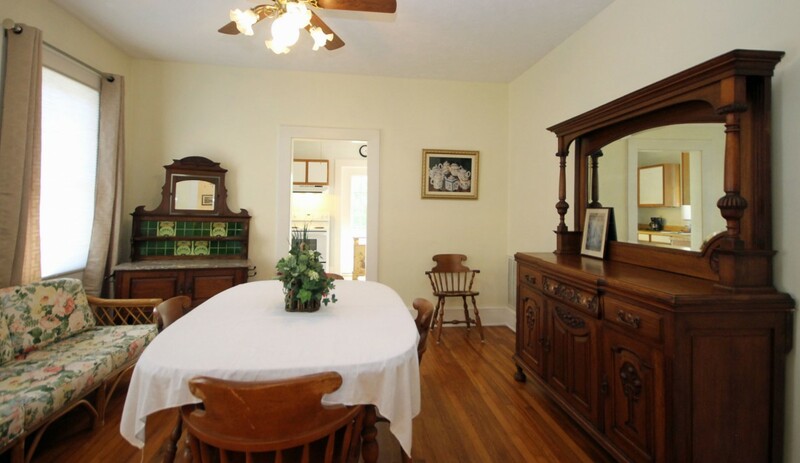 We love all the old furniture in this home, and the pieces in the dining room are our favorites. 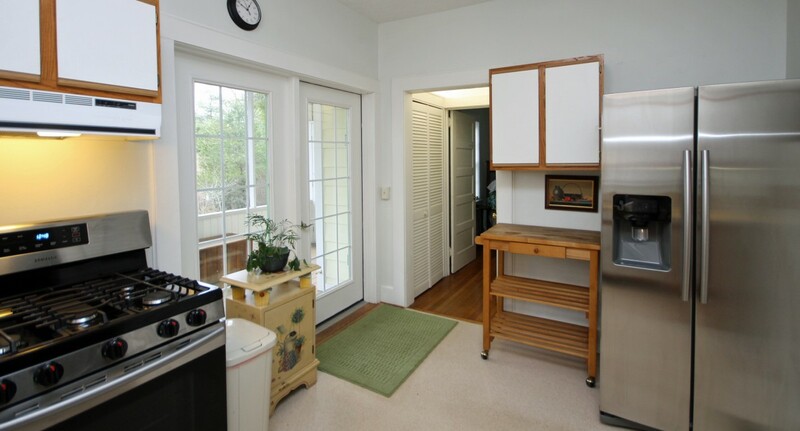 Here you can see the entry to the kitchen where it connects to the dining room. Here you are looking toward the second bedroom. The screened back porch is on the left. In the hallway are the laundry on the left and the half bath on the right. 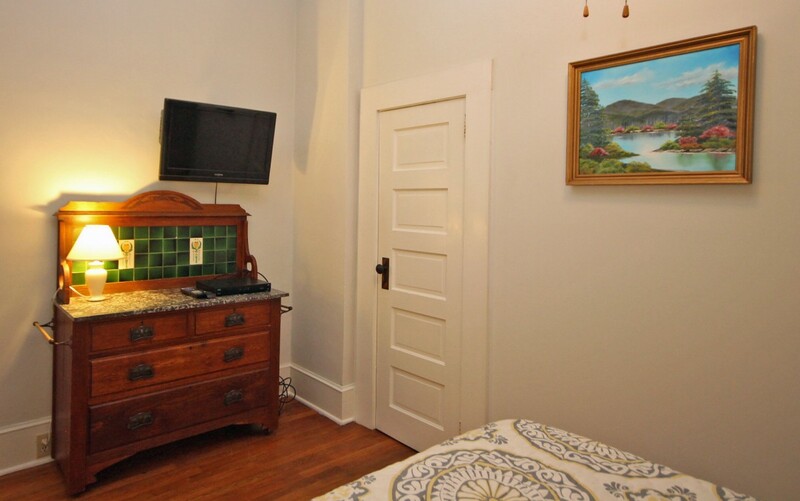 From your bed in the main bedroom you can watch TV. You can't beat a porch swing for pure relaxation! We love the tiled shower in the main bath. The back yard is a beautiful, peaceful place. Our family runs a local heating and air business. The owners of this home told us it was for sale when we came over to service the air conditioner. 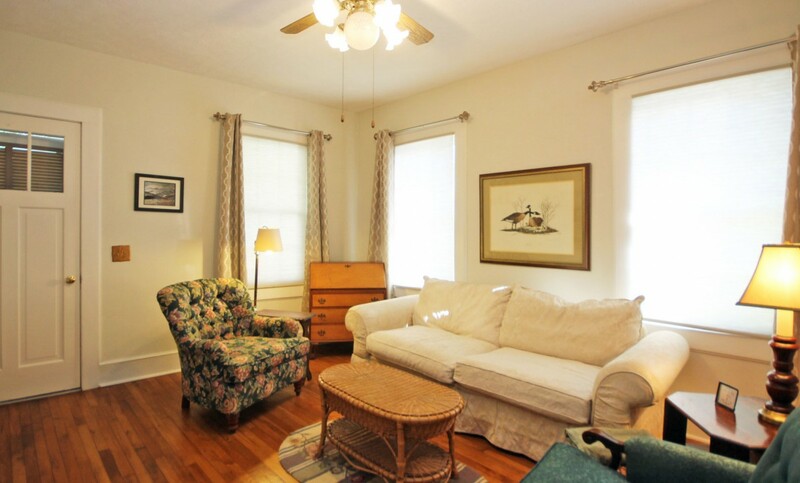 Located in a quiet downtown neighborhood, it is the perfect blend of convenience, comfort and relaxing atmosphere. We were excited to take on the challenge of updating it and making it into a place we could enjoy and share with family and friends. Now we are happy to be sharing it with you! The home is a perfect family getaway, and it's great for dogs. There is a small fenced area in the back yard for them. The back yard is absolutely gorgeous because the former owner was a master gardener. It seems as though there is always something in bloom throughout spring, summer and fall. The quiet neighborhood is great for walking, and you can easily get downtown with sidewalks all the way. Check out the shopping, dining and scenery as you walk down Main Street. Be sure to check out The Proper Pot, a great kitchen store that also sells wine, cheese and other yummy snacks. Another favorite is Main Street Ltd., a great gift shop right next to Quotations Cafe which is known for the occasional patronage of Steve Martin, a seasonal Brevard resident. Of course, Brevard is home to the renowned Brevard Music Center, and is also host to annual festivals including the White Squirrel Festival every Memorial Day Weekend, great 4th of July festivals, the Mountain Song Festival every September, and lots of fun activities on Halloween (Brevard is in Transylvania County, after all). It's a quick drive to the Porter Center, which is the performing arts venue for Brevard College. We are five minutes from the Brevard Music Center, home of the Mountain Song Festival and many other exciting musical events throughout the season. You can get to Pisgah National Forest in about ten minutes, the DuPont State Forest is about a 20 minute drive, and it takes about 30 minutes to get to the beautiful Gorges State Park. Asheville and Hendersonville are both about 40 minutes away, and both feature lots of attractions if you want to take a day trip or two. We hope you enjoy our mountain getaway as much as we do, and thanks so much for choosing us! Please no cats in the house, as the owners are allergic. Please bring a crate if you leave your pet alone in the house. 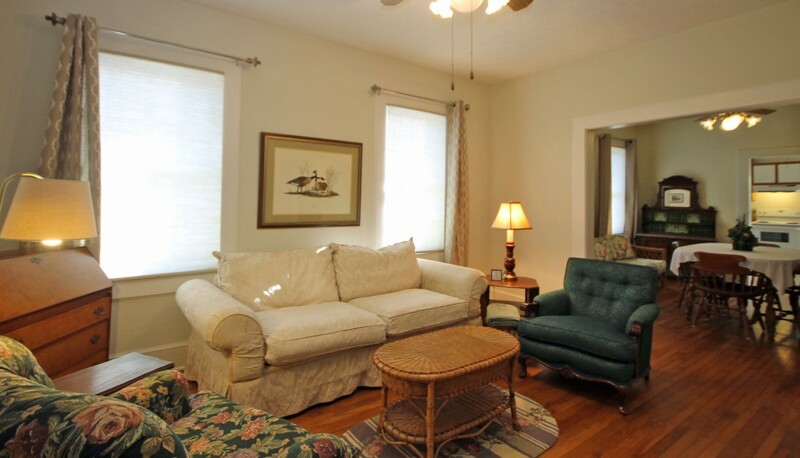 Great comfortable house in downtown Brevard. Close to everything. Very much enjoyed it again this year (our 2nd) Very close to downtown. Our group of four adults and two children were very comfortable in this house! Everything was provided. We were here right after the winter storm dropped 16 inches of snow. The house was well heated and the neighborhood quiet. We'd stay here again! We appreciate you staying and are so glad that you and your family enjoyed your stay. Nicely fixed old house, comfortable. Location is great. Clean. Not many extra towels, and I found only one extra blanket. Somebody said a bed was too soft. Mine was quite firm. I think the twins in the 3rd bedroom were the goldilocks beds "just right", so you have your pick. I wasn't there long enough (long weekend) to take up cooking, but I liked that there are spices in the kitchen so you could without having to bring or buy every thing. The dog loved the yard but be advised there is a stairway down to it. If I'd had my old dog (died this year) he would not have been able to navigate it. Also be aware there is cable but it is "basic". My son was all geared up to watch a nationally televised favorite football team on ESPN and there are no sports channels. At all. Otherwise it was very good. 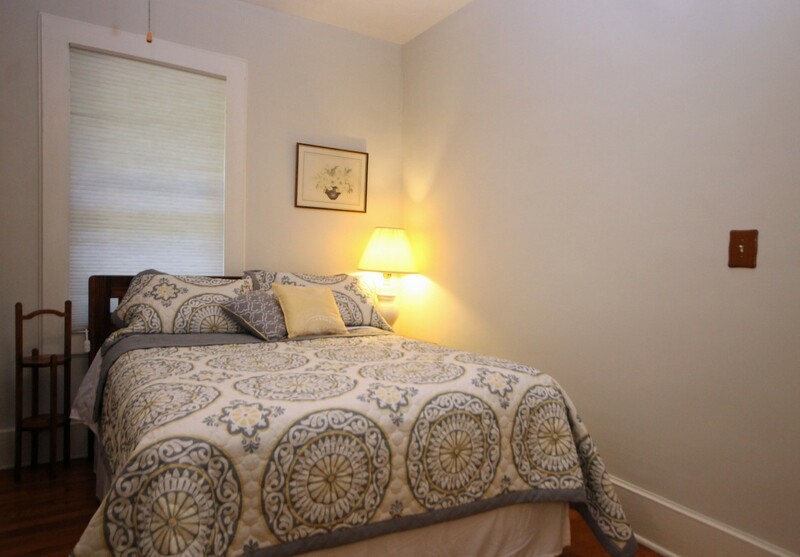 We do find that beds are a very personal preference and we get positive feedback on the mattresses at the house. The cable package is basic so there are not a lot of channels. There is wifi for guests to use as well . However many of our guests come to Brevard to get outside and enjoy the mountains and unplug for awhile. Great to hear that you had a good stay. Thank you for renting. Outstanding location;new appliances; very good stay. It was a pleasure to have you stay at the house. Thank you for staying. Clean, updated but maintaining authentic character of a time and place Appliances great, cute fenced in yard so good for my dog!! 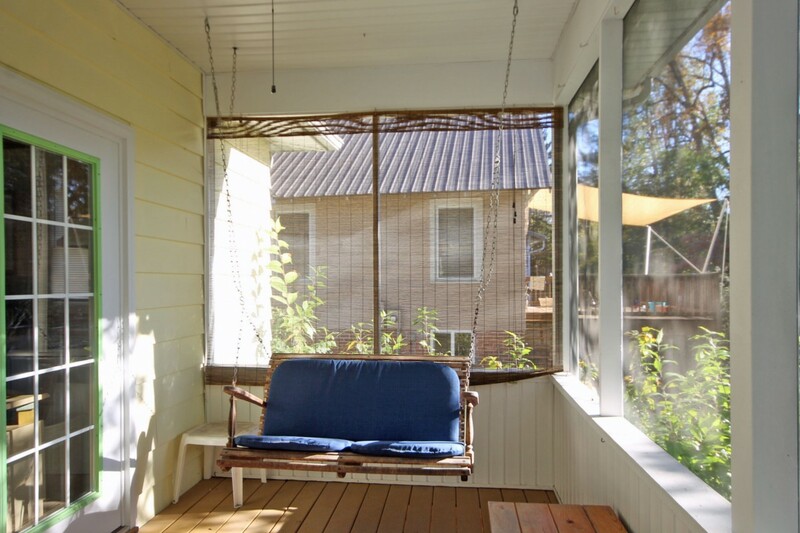 A screened porch overlooking rear yards and trees. Perfect location to walk among friendly neighbors and go to shop and restaurants. I would certainly comeback. Thank you for the lovely review. We love this house and are glad you and your dog did too! We enjoyed this little house very much. Everything was clean, washer and dryer worked well. It was an easy walk to downtown and the front and back gardens were lovely. We especially enjoyed the swing in the porch. The only small negative is that I believe the beds are only full sized and they were very soft (too soft for me). I would definitely stay again next time in Brevard. WE appreciate you renting the house and glad that you enjoyed your stay. One of the beds is a full and the other is a queen. Most guests find the beds really comfortable but we do understand that everyone is different and some people prefer a harder mattress. The house was fantastic. It was in a perfect location close to town, so you could walk to all the shops and restaurants. The three bedrooms worked great for us and the living area was large. The outside was nice also, especially the front and back porches. We look forward to staying there next time we come to Brevard! So glad that you loved the house. The location really couldn't be better. My mom owned this property for many years and we loved being back for a visit! It has been well taken care of and is as "homey" as ever! It is very close to town and, as always, we tried to walk whenever we could. We enjoyed a picnic lunch at Lake Lure and loved wandering through the Bullington Gardens! How lovely to be able to sta at your moms old house. We are glad that you where comfortable and enjoyed your stay. Came to visit my Mother who lives in Brevard. to the coffee shop and shoped around in town. We are so glad that you enjoyed your stay and it was convenient to your mother. The cottage is very well equipped. It is very cute and cozy. Itâ€™s within comfortable walking distance to town. My husband, toddler and I were very comfortable. Thank you for opening your home to us. Thank you for staying. We are glad you and your family enjoyed your time at the house. Great location, walkable to downtown amenities. Glad that you enjoyed your stay! We are glad that you enjoyed your stay. We look forward to having you come stay again! Myself and 3 guests stayed their for the Assault on the Carolinas bike ride. 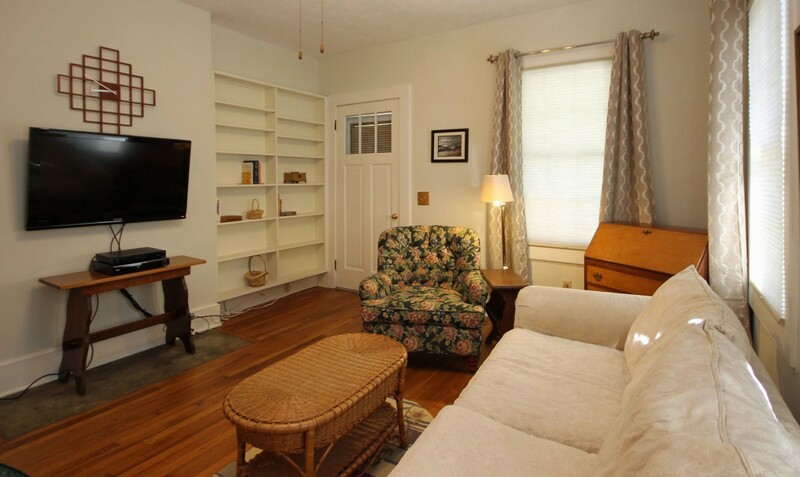 The house is in a perfect, quiet location, only 2 blocks from Main St.
We are so glad that you all had a good stay and enjoyed your time at the house. We hope you can come back again and do some more mountain biking. Great property. Awesome gardens. So convenient to downtown. Beds comfortable. Appliances like new. Thank you for staying. The garden is really such a lovely place. We are glad that you had some warmer weather to enjoy it during your stay. I rented the property for over a month and I thoroughly enjoyed the experience. 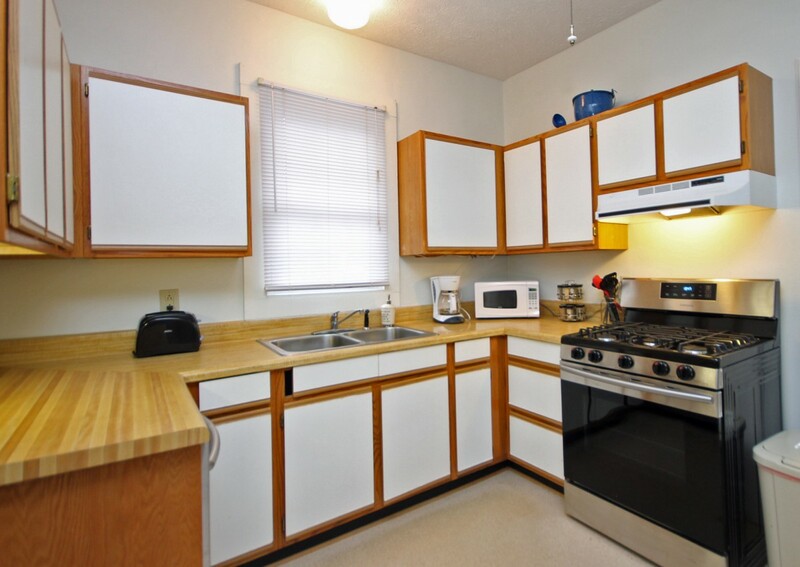 The property is lovely and includes everything one could possibly need for a stay - fully equipped kitchen (with new appliances), plenty of nice towels, etc. The location cannot be beat because it is in the center of downtown Brevard, just a few blocks walk to restaurants, bars and shops. Pisgah National Forest and DuPont State Forest are a short drive. Pete, Elisabeth and the rest of the rental team were excellent and very accommodating. I will definitely book this property when I come back to visit the area! Joshua was an ideal renter. He was clean and respectful and we would welcome him back anytime! House was as described. 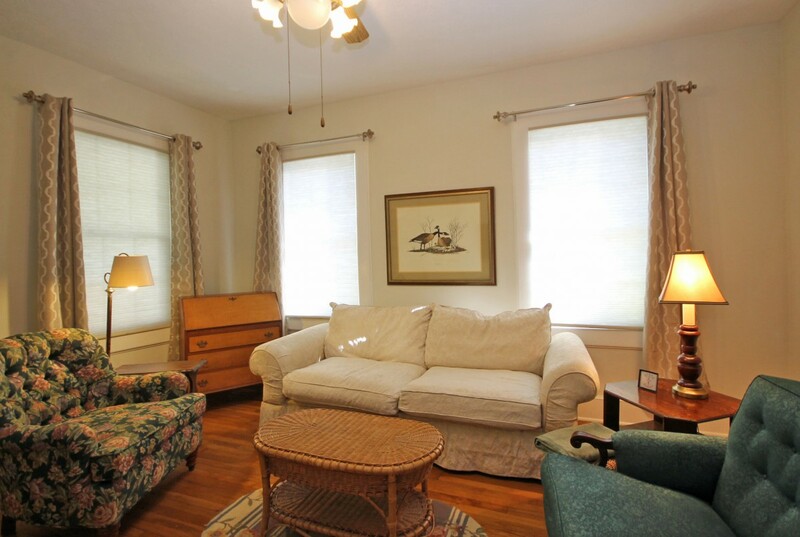 walking distance to all downtown attractions. THank you! We are so glad that you enjoyed your stay at the Maple Street house. We hope you can come stay again soon. We where so happy to have you stay at the house again and are so glad that it is a good fit for you when you are in Brevard. We look forward to having you come stay again! Love this house. Our third time here and will definitely come agin. We are so glad that we could host your stay again and look forward to having you back next time. We were there for our 50th Reunion at Brevard College. We had a lovely stay at 58 Maple St. The house was spotless and had been renovated. We had a dinner party for some classmates and there was plenty of room for everybody to eat. This is one of the best houses I have rented in Brevard in a long time. The location was perfect and within walking distance of downtown. I will definitely be back. The houses really is lovely and in the perfect location for walking into town and enjoying Brevard. We are so happy that you enjoyed your stay. We were thrilled with this cottage! It was tidy, and oh so cozy. My son who is 15 brought his three friends to go mountain biking. In the evenings, I was comfortable letting them walk into town, which is a few blocks away. My husband and I walked to the charming farmer's market which was around the corner, Saturday morning. Thank you so much for a wonderful weekend! A truly memorable time. We are so glad that you where able to spend a few days in Brevard with your family it sounds like you had a lovely time! We absolutely love the location of this house and are so glad that you did too. We look forward to having you back. Lovely home in a fantastic town. Thank you for choosing to stay at the Maple house. We are glad that you enjoyed your time in Brevard. We loved our stay at 58 Maple Street. The location is ideal--a short walk to the center of town--the house is comfortable, the screened porch is fabulous, the neighbors are friendly, the people in charge are helpful . . . We could go on and on, but you get the idea. We've been coming to Brevard for more than a dozen years and have stayed at more than a dozen different places. This one ranks at the top in our book. Thank you both for staying at the house. We look forward to having you stay again. This a great cozy cottage downtown. We walked to Main Street/Broad. We had a fabulous dinner at Square Root and delicious lunch at Blueridge Bakery. 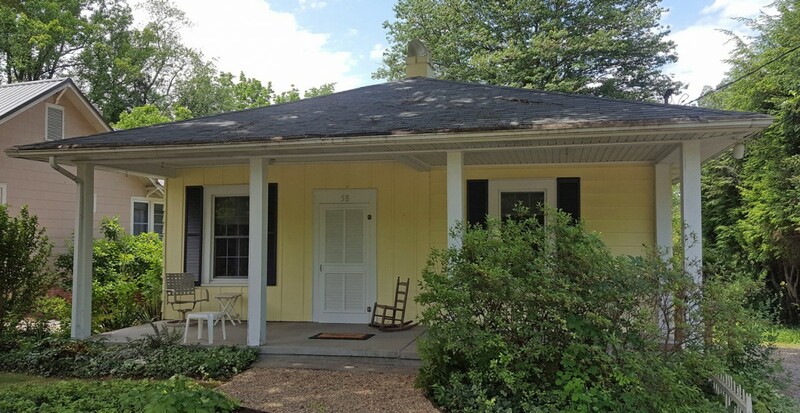 We also saw an event at the music center, and hiked, saw waterfalls and tubed down the French Broad for 2 hrs(Headwaters Outfitters).The cottage was so peaceful, the screened in back porch overlooked a well loved mature garden, there was music from the birds, bunnies hopping and fireflies at night. The bed was cozy, tv in living room and bedroom, all the necessities we needed (except an iron). Oh, and did I mention the porch? We will be back often as this is the stuff dreams are made of! We love this little house and are glad that you did too. The location can't be beat and the yard really is a magical place. Wow! What makes this house great? 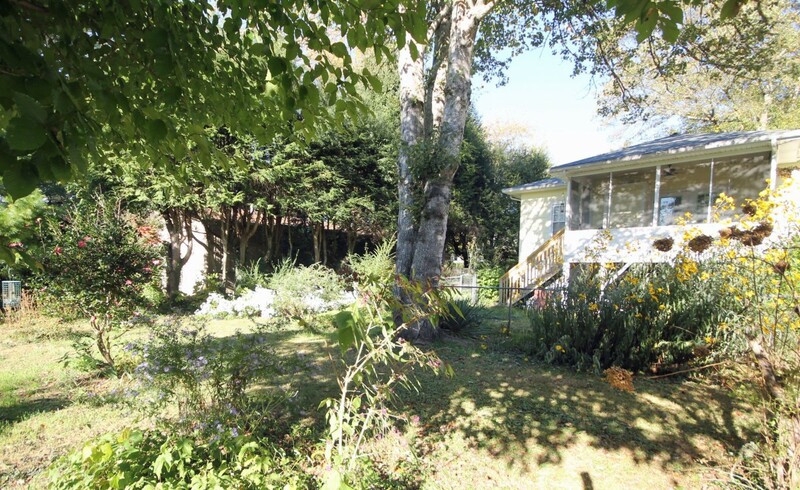 Three things: (1) the wonderful downtown location close to the farmers' market and restaurants, (2) the view from the outdoor screen-in porch over the garden and the (3) the SPOTLESS cleanliness of the home. I have rented my homes, this is not glamourous but it is fabulously functional. We are glad that you enjoyed your time at the house. The location really can't be beat. We love the backyard too and are so glad you where able to enjoy it. The house was in a great central location. I could walk to everything in town. The yard was beautiful and a huge voodoo lily was blooming. We love the yard to it is so lovely! Loved this house. 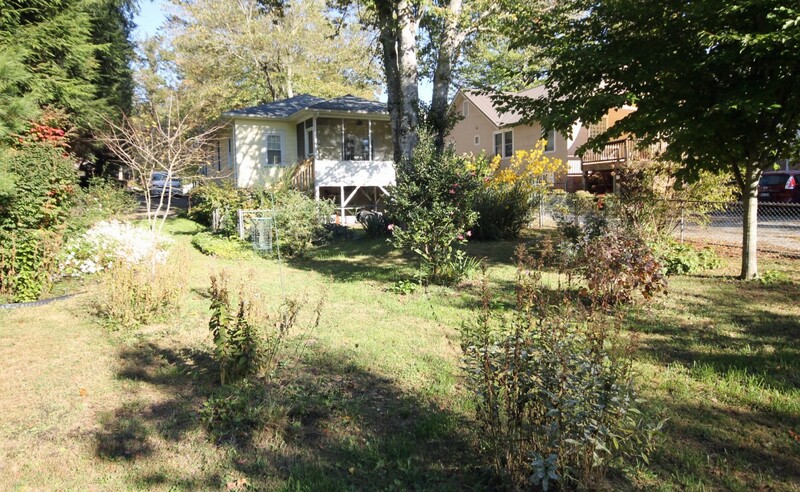 Beautiful back yard, 2 blocks from downtown, quiet neighborhood. Will stay here again. We are so happy that you enjoyed the house and look forward to hosting you again. Great house for long weekend. 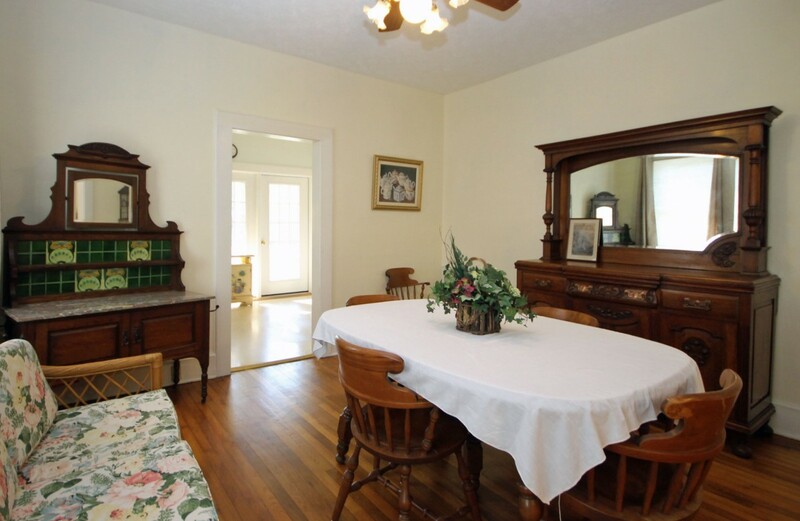 The house is on a nice, safe street and an easy walk to downtown Brevard. In fact, I honestly do not think you'd want to be any closer. Quiet neighbors who I'm sure will appreciate respectful renters. The house was very clean. Really enjoyed the screened in porch. Rental company responsive. Good internet. We spent our time hiking and biking in surrounding forests. Loved St. Gorges State Park. If you like the outdoors, you'll enjoy Brevard and this location. We love to read reviews like this from our guests. 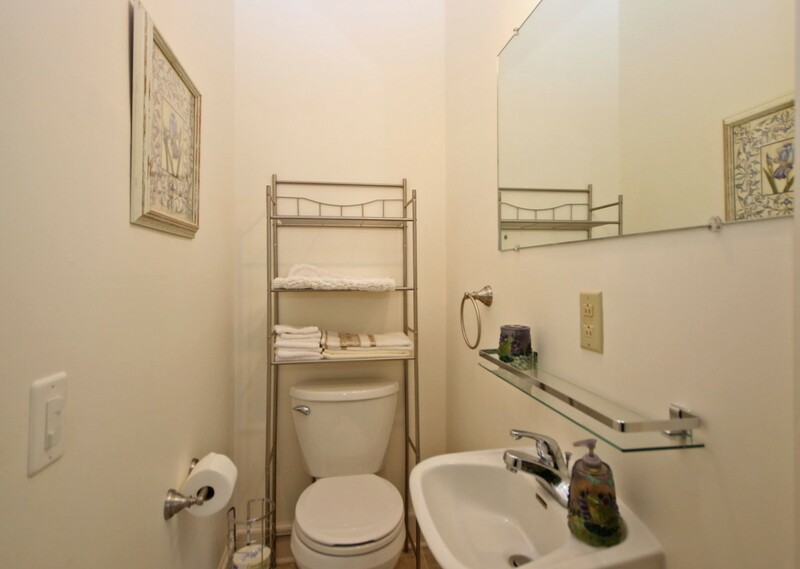 We strive to provide a house that will fit the renters individual needs and be a cozy home away from home. It is always a joy when guests find the right place. Great home in perfect location in town. Lovely back porch. Spacious with a nice layout. We are so happy that you enjoyed your stay. Thank you and we hope that you can stay again. This home was just what we were looking for to enjoy our week long stay in Brevard. The fenced in back yard was great for our dogs. The screened in porch was so nice to enjoy the weather on! The quick 5 minute walk to downtown was perfect as we went out to eat and checked out the local breweries. The home was cozy and comfortable with everything we needed and the rental company was just a phone call away if we needed anything. Great place to stay and would definitely stay there again. Molly was the ideal guest. She called with questions and we where happy to help her right away. We would be happy to have her stay again anytime! This house and location were perfect for our long weekend in Brevard. We could walk to the downtown area and both DuPont and Pisgah were 10 miles away. The house was very clean, the beds comfortable, and it was stocked with everything we needed to cook in the kitchen. I would highly recommend this home and will stay again on our next trip to Brevard. We are so happy that both the house and the location where a good fit. We look forward to your stay in the future. Thank you for renting!